One myth about museum education is that learning only takes place within the geographical confines of a museum space. Families, children, and other museum audiences are expected to travel to museums—many times outside of their own communities—to experience them. A new Hammer Kids series called Art Without Walls disputes this myth through a partnership with the Los Angeles Public Library. Art Without Walls is a program that takes place at two sites. Families are invited to the library and/or the museum to create art inspired by social justice issues, children’s literature, and Hammer exhibitions. As a Student Educator at the Hammer, I had the chance to work at two of the programs that took place at the Felipe De Neve Branch of the Los Angeles Public Library: A is for Art and Activism and How Would You Defeat Racism?. I first signed up to work these programs as a chance for me to connect to the wider Los Angeles community through arts education. As an educator, I regularly tour visiting groups through our exhibitions at the museum, but I wanted an opportunity to work in neighborhoods outside of Westwood. My role at these programs was assisting workshop leader and artist Sandy Rodriguez. This included checking in families, walking them through the activities, and setting an example by doing the activity myself. While at the museum I often take the lead on tours, during Art Without Walls I took the back seat. I was able to learn from Sandy and focus on making art as opposed to strictly learning about art. 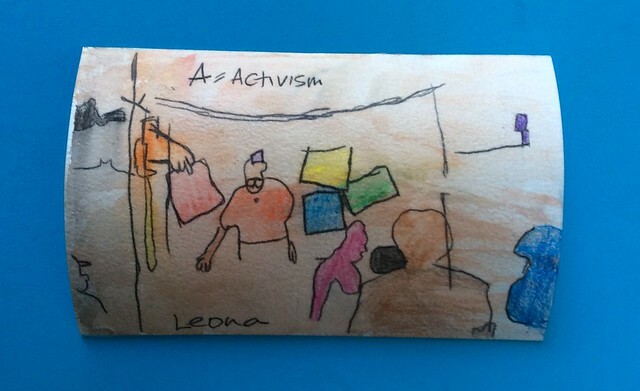 "A is for Art and Activism," the first program I worked, was fantastic because I was able to connect with families and youth through art in a new place. The activity was based around attendees contributing to a collective book of ABCs by drawing a letter and image associated with that letter. When displayed together, an activist alphabet was produced. It was clear how important the Felipe De Neve community library is to the wider community, and I saw the enjoyment that kids and families had when visiting it. To be a part of this was exciting not only because I experienced other parts of Los Angeles, but also because it brought me back to my upbringing in the Southside of Chicago. The way in which this event was flooded with eager groups of kids (who created amazing work, I must say) excited to participate in our activities was inspiring, and it serves as a testament to how important community-based programs are to the youth. The second program I supported, “How Would You Defeat Racism?” was focused around the theme of racism. Attendees were asked to create a sign depicting or stating how they would defeat racism, read it aloud on video, and add it to a wall of traced figures—ultimately creating a wall of anti-racist sentiments that we all agreed to work toward. It was humbling for me to see the hopefulness that the participants all had in working toward an anti-racist world. I even had a chance to come up with my own way to defeat racism and artistic rendering of how that could be done, and record it on camera! This was impactful for me because as a college student whose experiences have been heavily influenced by racial discrimination, I was able to hone in on how I will personally combat racial discrimination through my artistic practice. As a design major, I push myself to engage with this topic very implicitly in my own work, and it was great to be able to bring younger and older generations into this pursuit. Another thing I appreciate about Art Without Walls is the fact that though it is targeted toward younger audiences, it isn’t exclusive to them. Guardians and chaperones of children often got involved in the projects—either helping the children they came with, or even making the projects themselves. The “How Would You Defeat Racism?” video doesn’t only feature kids, but also adults equally enthusiastic about the program. The Art Without Walls series is important because it engages children with social issues and helps them grow a level of awareness that I find crucial in this day and age. With all that has been going on in our country and in the world that push false narratives onto youth, it is important to dispute institutionalized norms that oppress so many communities. Art allows us to be creative while responding to social justice issues. Giving communities, and particularly youth, the opportunity to make their own socially conscious art doesn’t only educate them about what has been done in the past to bring us here, but also empowers them to create change going forward. Our next Art Without Walls program, "Wear Your Activism," is on Saturday, June 10 at the Felipe De Neve branch library, with the same program the following day at the Hammer Museum.